This 1957 classic is a work of fiction although based on true events. During World War II the Imperial Japanese Army used Allied troops as slave labour. The construction of the bridge as part of the Burma Railway was true enough. Yet, what plays here is a battle of wits. Colonel Saito, the Japanese Commandant, must build a bridge using British troops. But, he meets his match in the stubborn form of Lieutenant Colonel Nicholson. 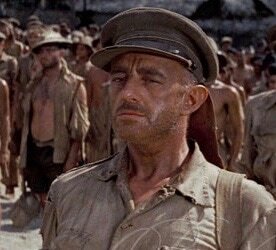 Alec Guinness puts in a career-defining performance as the obdurate British officer. Nicholson insists on proper adherence to rank and protocols. He refuses to allow his officers to work. For this, he suffers repeated assaults and lock ups in the hot box. Meanwhile, his men are busy working as slow as possible. They sabotage the bridge construction at every opportunity. With the project failing and a deadline approaching Saito must act. He finds an excuse to release Nicholson from punishment. Then Nicholson inspects the bridge and decides the construction is bad. In a stunning switch, he proposes a new bridge downstream. Over tea, he presents plans to the Japanese. Saito has no option but to agree. Working under their officers the British troops set about building a new bridge. To save face the Japanese get coerced to join the work. Nicholson is now exercising de facto command of the whole project. Meanwhile, an escaped prisoner is returning with commandoes. They are intent on blowing up the bridge. In the final moments, Nicholson discovers the plot to destroy his bridge. An exchange of fire takes place with Nicholson injured. He falls on the plunger that fires the explosives to destroy the bridge. In the process, a troop train falls into the ravine. The movie asks some important questions about leadership, collaboration and maintaining morale. Initially Nicholson comes across as a military buffoon, but he emerges as a stout leader who keeps his men alive.